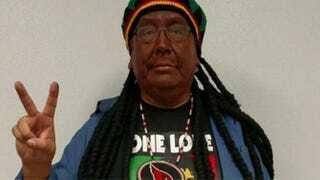 Calling it a "poor choice," an Arizona Native American leader apologized this week for wearing blackface while dressed as Bob Marley on Halloween. "Recently, I posted on my Facebook page a picture of my Halloween costume dressed up in reggae style," Terry Rambler, chairman of the San Carlos Apache Tribe in Arizona, wrote in a Facebook post Thursday. "I did this thinking I wanted to dress up as one of my favorite musicians, Bob Marley," he continued. "But in hindsight, it was a poor choice I made. I am not a racist and I did not mean to offend anyone but I realize I did. There is no one to blame but me. I take full responsibility for my action." Rambler came under fire almost immediately after posting the image of himself decked in a dreadlock wig and dark face paint and captioned, "I had fun tonight at the Bylas Halloween Carnival." Some critics found his costume choice ironic, given that he has pushed the Washington Redskins to change their name because it is offensive to American Indians.